The goals of manual treatment are to stimulate the metabolism and blood circulation of soft tissues, as well as to restore the normal mobility of vertebrae and joints. In the manual treatment of back-related ailments, it is important to pay attention to interaction between the spine and muscles. The results of chiropractic mobilisation or massage treatment alone may not be as good as expected, but as soon as these manual methods are seamlessly combined, more reliable and permanent treatment results are obtained. The third corner of the “anatomy triangle” is often more or less ignored during treatment. Although, the brain is the centre of all vital functions, and the heart the engine that keeps the body going, the BACK, and the functionality of the neural pathways are of uttermost importance. Manual treatments suit people of all ages and physical conditions (so far, my youngest patient has been 4 years and the oldest 94 years old). Treatment is not always by the same routine. On the contrary, the best possible method is determined and applied case by case, thus ensuring that the treatment is as comfortable and riskfree as possible, yet effective. 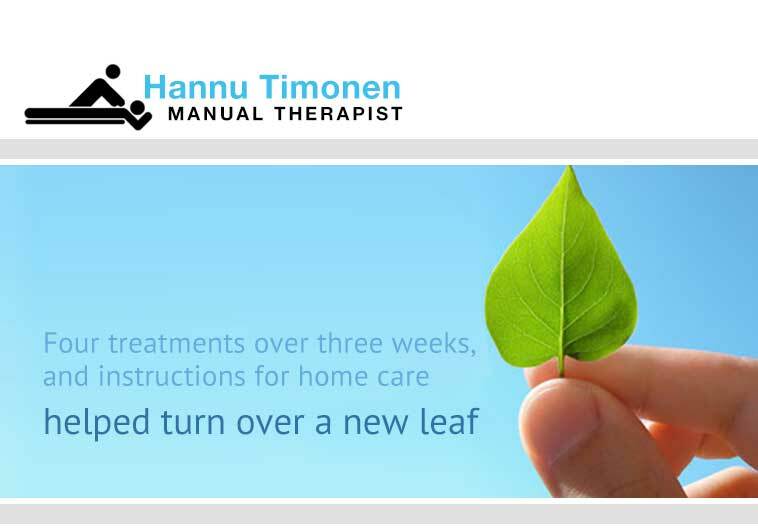 One treatment session costs 80-140€ (usually 4 treatment sessions are required). Although Kela (the Social Insurance Institution) does not refund the treatment costs, the costs remain reasonable – and what is most important, healing is fast and effective.